Visit Accenture at WITI's 11th Annual Silicon Valley Conference! 11th Annual Silicon Valley Conference is this week! It's not too late to join us at our 11th Annual Silicon Valley Conference. Come for both days, or just one. Stop by the Expo or plan to celebrate the 10th Anniversary of WITI's Hall of Fame. Details and registration availble at www.witi.com/sv/. Starting this month, WITI is helping sponsor an all female video gaming team to compete at professional tournaments. The PMS (Pandora's Mighty Soldiers) Clan is the world's largest female gaming team that was formed over three years ago at the launch of Xbox Live. Competing on all gaming platforms, and with over 400 girls and women from across the globe, PMS Clan is bringing recognition to female gamers everywhere. Recently featured in Entertainment Weekly, Tips and Tricks Magazine, and a gaming special on MTV, these players mean business. Marie Wieck, vice president of IBM's WebSphere platform was recently awarded the prestigious Work/Life Balance Award from the Society of Women Engineers (SWE). Specifically, the award was granted to Wieck for her role in establishing a landmark program for IBM to improve the ability of all employees to balance work, family and personal interests. Recipients of the SWE award are both an inspiration for those who strive to improve the work environment for all employees and a source of ideas for innovative programs. Throughout her more than 20-year career at IBM, Wieck has been a work/life pioneer and champion. Wieck sponsored IBM's "Family 360" pilot, designed to help people understand their work and family challenges from the perspective of their loved ones and family members. This past year, the council organized the participation of IBM women in the NYC American Cancer Society Breast Cancer Walk to provide a forum for women to convene outside the work environment and give back to the community. She also sponsored the "Talking to Children about Work" initiative, which provides advice on how to have meaningful conversations with children about parent's professional lives. Wieck has been a tireless supporter of part-time and job-sharing options, and personally participated in a 18-month pilot as a part-time executive. She is an active mentor through her participation in MentorNet, which reaches women in college, as well as job shadow programs within IBM. She also is a formal mentor at IBM to more than 20 employees. Wieck also serves as co-chair of the IBM U.S. Women's Council and chairs the work/life subcommittee. She has implemented several programs to help IBM's employees address the challenges of balancing work and personal commitments. Among these accomplishments, she created IBM's quarterly Tri-State Networking Event to provide a means for IBM women to meet and discuss pertinent career issues. WITI gladly accepts submissions for publication. For more information or to make a submission, please visit the Members' Area. 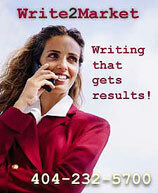 Write2Market provides writing that gets results. From sales/marketing materials to technical documentation, you'll appreciate writing that communicates with precision and delivers the business results you need. International and technical clients are welcome. Write2Market's prestigious client list includes UPS, ADP, Georgia Department of Transportation and Hedgewood Homes. Award winning copy--affordably. Learn more at www.write2market.com or call 404-232-5700. The WITI Hall of Fame was established in 1996 by WITI to recognize, honor, and promote the outstanding contribution women make to the scientific and technological communities that improve and evolve our society. Mark your calender to join us in Silicon Valley in December for the Tenth Anniversary Celebrations. This individual will lead and direct proposal activities, the development of ATE systems, subsystems and instrumentation from concept development through validation, and conceive, propose and lead R&D initiatives for advanced ATE applications. Responsibilities will include engineering the design and prototyping of new and next generation Automatic Test Equipment stations, testers and instrumentation using highly integrated technology including synthetic instruments. The successful candidate must have direct knowledge, system level and detail hardware design from DC to 40 GHz; direct, significant experience in the application of ATE systems and instrumentation for the testing of RF, Microwave and high power Radar Systems. Experience in the design and development of Test Program Sets, Self Test and Calibration software is required. For more information about this position, please contact Sheryl Shepherd at [email protected].